I took a trip to Charleston, SC this past weekend, and even though it was a “vacation,” I found myself catching some interesting marketing techniques used by different groups. I’ve noticed for a while that many organizations don’t have a fully integrated online marketing communication plan, which is somewhat understandable as it is hard to adjust to all of the different online marketing media available. What is more shocking to me is that so many businesses still fail to connect their online and offline marketing. That’s why a huge smile came across my face on the trip after seeing a couple of great examples of online/offline integration. The first example is a small boutique store named Bijuju (formerly known as Vanity). This little store out thought most national brands by having cards pushing their different social media presences strewn across the store. In addition to simply having these cards, they also provided a compelling offer with the taglines “Be a fan on facebook. 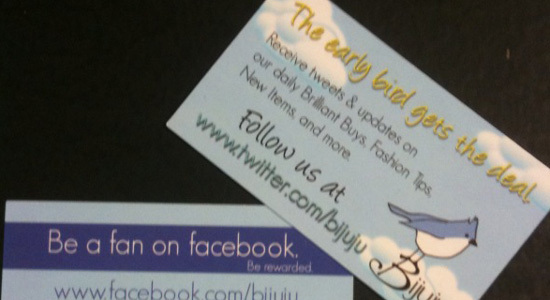 Be rewarded” and “The early bird gets the deal.” Kudos to Bijuju for connecting the dots and doing some great marketing. The second, larger example were the state of South Carolina’s license plates. They did something that I haven’t seen (or at least noticed) on any other state’s: they put their tourism website’s address, www.sctravel.com. For virtually no cost, this strategy allowed them to increase the site’s exposure and impressions by millions. They essentially purchased several million moving billboards to promote their state. These are two simple examples that likely have big results for these two businesses. Here’s a quick checklist of three things your organization can do to tie together your offline and online marketing. Have your website and social media on your business cards (if you still use business cards). Most people hold onto a business card and let it go through the wash at least once. While they may not remember you or the discussion, by putting your web and social media addresses on your card, you increase the likelihood of them interacting with your brand in the future. Push in-store specials through the web and social media. Just because you’re talking to someone online doesn’t mean they don’t exist in the real world. Use social media updates, blog posts, online news releases, and more to let your online community know about specials or events happening at your physical location. On-site email signups. Ask customers, volunteers, lurkers, and everyone else for their email addresses. It can be as simple as a pen and paper (trust me, it’ll be worth spending the time to type them into your contacts database) or you can have a laptop station set up, but always push for an email address to stay in contact with them and give special offers. There are infinite other connections and I encourage you to add them in the comments. Remember, that by taking a page from Bijuju and also presenting a compelling offer of special deals or offers, you greatly increase the likelihood of people actually following your push. Have you seen any other great offline/online marketing connections?